As a contractor working with Pedersen, we have your back. Our goal is to move as close as possible towards a ‘zero harm’ outcome, where all possible risks are eliminated, reduced or successfully managed. This article is a short introduction to our health and safety management structure. For more information please get in touch by email or phone, and we will send you the full policy documents. Compliance to HSE recommendations for working with poultry dust are a minimum starting point for health and safety, not the end goal. The responsibility still lies with businesses to work together to ensure ever higher standards of safety and to minimise the risk of work-related hazards. Our senior management team are serious about encouraging a proactive approach to health and safety at Pedersen, with clear communication among employees at all levels. Our ongoing training and health and safety conscious workplace culture encourages the identification of hazards by all contractors and employees, followed by their elimination, reduction or control. Health and safety at Pedersen is overseen by one of our company directors, with assigned duties being given to Health and Safety Coordinators to cover specific areas of work. 3) Demonstrate continuous performance improvement on Occupational Health & Safety Management goals. Our thorough risk assessments are carried out by Competent Persons to assess the health and safety impact of all activities and workplaces. Each risk assessment identifies potential hazards and persons at risk, and reports these findings to our senior management team. Based on this, control measures are implemented. If possible our goal is to remove hazards entirely, but failing this, every possible measure is taken to reduce or manage risk. Performance testing of all other machinery and PPE. Our safety training policy ensures that all employees and contractors are equipped with the knowledge they need to apply H&S control measures appropriate to their role. Training needs are addressed regularly in response to new or increased levels of risk, new work equipment or the introduction of new technologies. Specific responsibilities are assigned to named individuals, but everyone has a part to play in keeping the workforce safe. We also make sure that there are always more than the minimum number of qualified first-aiders present in every working team. High quality personal protective equipment is essential when working in an environment where poultry dust is present. Poultry dust is a ‘hazardous agent’ as defined by the Control of Substances Hazardous to Health Regulations (COSHH) 2002. It is also a ‘biological agent’ under the CHIP Regulations. Airborne particles present in poultry dust have been linked to several health hazards, including asthma, ammonia poisoning, allergic reactions (from grain dust and mites), bacterial infections and long-term respiratory illnesses. The Health and Safety Commission therefore imposes strict workplace exposure limits of 4 mg/m³ of respirable dust or 10 mg/m³ of inhalable dust, over the course of an eight-hour shift. However, using the right PPE significantly reduces these risks, so that exposure to poultry dust is minimal. Using the following protective clothing we exceed mere compliance, to give added protection to our workers. At Pedersen we are proud to work with many of the leading poultry farmers in the East of England, with our team of professional, highly trained poultry cleaning contractors. 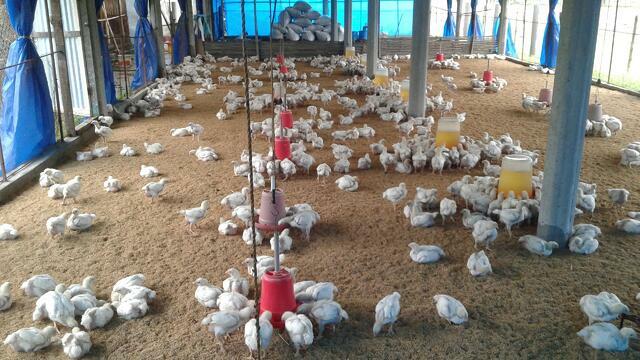 Our reputation for safety, value and high levels of service delivery underpin our reputation as one of the area’s leading poultry services consultants. To find out more about our services, or to work with us as a contractor, please get in touch by calling 01526 353 978.